This is a very beautiful car. Very beautiful. ...... ....... That was a long pause so you can have a good look at it. In fact have another look at it from a different angle. 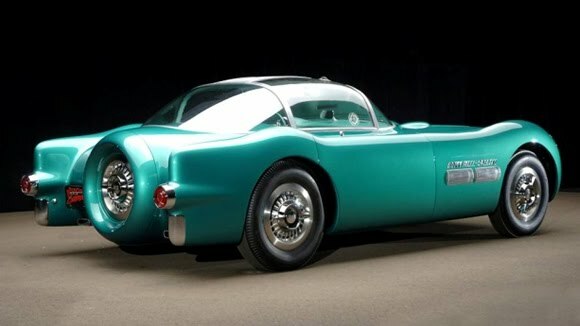 The Bonneville is another Harley J. Earl handbuilt concept car. It was the first Pontiac to have the name Bonneville and amazingly, I think, it was used as the performance platform for 47 years. The plexiglass bubble has gullwing doors and the body was fibreglass with obvious inspiration from America's fascination with rocket design. The scoops on the bonnet worked and the recessed headlights have been copied by hot rodders and other car manufacturers ever since. Check out the spare wheel cover. It looks like it's going to start glowing and once a button is pushed launch the car into hyperspeed like the Batmobile of Adam West. 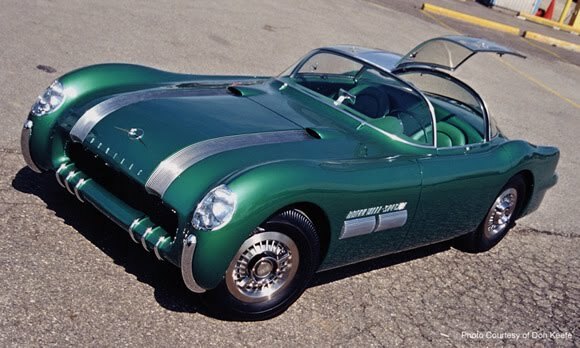 The Bonneville set the style at Pontiac for a long time and what I like about Harley J. Earl concepts is they were generally driveable. He used to use them as daily transport. The two Bonneville's built had 268ci Straight 8's that were reported to have had 300hp. A lot for the time. The motors were detuned for production and there is a rumour the Bonneville's could have had the new V8's but GM marketing said to hold the motor back for release the next year. Look out for these cars at an auction on day because they still exist and might come up for sale. However you will want to have a big cheque handy as the green one was sold for US$2.8million in 2006. My apologies. I have written about Harley before and I didn't notice that glaring mistake in my haste. Thank you for picking it up.